This week we’re discussing the benefits of brand blogging. Here at full service digital agency DVO we’re big supporters of clients optimising webspace. Sounds straight forward, of course as a business you want to optimise all your resources and channels and brand blogging can be a great way to achieve this. But in today’s New Normal, as marketers and business owners, it can be challenging. 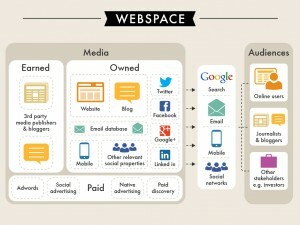 So what exactly do we mean when we say optimising webspace? Well, it’s the practice of looking beyond a brand’s site or blog to create an overarching online marketing presence. Any approach that doesn’t encompass every element, from e-commerce to social media to blogger outreach, will create an incomplete, confused or broken machine that isn’t ready to take on a well-rounded marketing strategy. We’ve seen this time and time again with clients, where responsibility for different digital resources can sit with different departments and silos are a very real problem still. So having a strategy that sits above this and pulls all the elements together effectively is vital and will actually make each channel work harder and produce better results. We’ve written a series of articles, breaking down the different areas of webspace, explaining what they mean, why they are important and how you make them work harder for you. Owned media has many different aspects and may seem daunting. But it’s also the most accessible and easiest means by which connect to your audience. At the centre of this should be your brand’s blog. Why? Well, for many reasons but here are some key stats that you should be aware of, especially if you’re not convinced of the value a blog can bring to your business. A blog produces 97% more inbound links to a company’s site compared to one without a blog. Companies that blog receive a massive 434% more indexed pages on average than those that don’t. Seriously, you don’t have a blog!!! Small businesses that blog will see 126% more lead growth compared to those that don’t. 23% of total Internet usage is on social media networks and blogs. Every client is different. They have different brands, different products, different attitudes and different approaches but most want the same thing: to get their brand known. When they ask if they really need a blog, the answer varies depending on what they are hoping to achieve. We hope the stats above have helped convince you of the benefits of brand blogging if you were sitting on the fence. A blog should be the heart of a brand’s owned media. Brand blogging is the motor that keeps it running. It provides the content that drives individuals back to your website. How can you get involved with social networks, your email databases and other channels without having something to say? For most companies, your website and blog exist to tell the world what you’re about and why they should care. Your site does it on a basic level, but your blog lets you go off on tangents. 60% of people feel more positive about a company that has custom content on its website than those that don’t. It shows a confidence and a level of expertise that consumers want from the companies they are buying from or interacting with. And if it’s content that evokes an emotional response and encourages further action like commenting or sharing, then that’s an added bonus. Working with clients who are starting out on their social media/blogging journey, we hear the same thing time and time again. What should I say, what should I talk about? Why would people be interested in what I’ve got to say? While understandable, this anxiety is often misplaced – you’re already an expert in your field so talk about what you do. Using brand blogging to explain your decisions, your journey, your beliefs, your successes and even your mistakes. After all, that’s what your customers are most likely to be interested in. McDonalds Canada is a great example of this, as can be seen in the fast food giant’s behind-the-scenes feature showing how burgers are photographed, hosted on YouTube. By being completely transparent about the dark art of food styling, the brand has taken something it knows intimately and created positive, engaging content that keeps its consumers interested and informed. The video has earned more than 11.3 million views. Whilst developing content marketing for Expedia, we knew we needed to put a fresh spin on what could have otherwise just been more of the same old travel blogging, creating content that would stand out in a cluttered space. We did that by flipping the narrative into the future, focusing on what you could do, not what we had done collectively as the writing team. Making it about the travellers and the experience they could have allowed us to position the content we created away from the rest of the market. We built a network of writers across 8 global cities who were our correspondents and formed the basis of our content marketing approach. Having this solid digital experience meant we could build in tactical campaigns highlighting new destinations, seasonal holidays such as Halloween and tie-ins with wider campaign initiatives. This is just one example of how we’ve used a brand’s existing know-how and worked with others to create useful content. Updating your blog at least once a week may seem daunting, but you already have the knowledge and expertise to share with your customers. And trust us, if you’ve got your offering and your branding right, people WILL want to listen. We’re here help bring it out. Talk to DVO about brand blogging on 020 3771 2641 or email us at iminterested@dvoagency.co.uk.